- Rhinos 1 Miami FC 0 - I didn't get to follow the match because my radio wasn't getting the WYSL 1040 am signal. But getting a goal from Mike Ambersley after Patrick Hannigan made a save on Matthew Delicate, but couldn't corral the ball, and killing the game was huge. Granted, the Rhinos four wins so far this season are all against Miami FC and the California Victory, but getting points on the road with as many home games left as the Rhinos have is always good. - I did a podcast with Triangle Soccer Fanatics (the official supporters club of the Carolina RailHawks) founder Jarrett Campbell ahead of Friday's Rhinos-RailHawks match at SAS Soccer Park. Jarrett has me believing that Carolina's rep as a dirty team may be overblown. And while I pushed him into a non-scoreless draw prediction, that's the way I'm leaning towards with regards to the RPMPL. 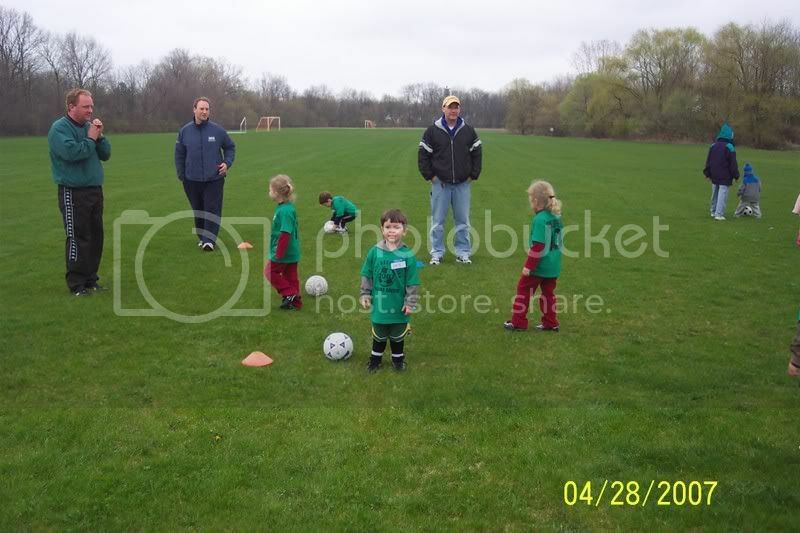 - My son had soccer, then we had Kick This!, and then I loaded up the family and took them out to the Rhinos Women's match against the Hamilton Avalanche. The upside was that the team looked good in their 6-2 win. Gretchen Miller didn't have to go to the prom, started up top, and was a force with two goals. My player of the game had to be outside midfielder Jacquie Lasek who had two goals and an assist and was all over PAETEC Park's FieldTurf surface. My older son liked the game better than most men's games because of the number of goals that were scored. Plus, both my sons enjoyed flirting with the players after the game at the player meet & greet. - Since I was at the Rhinos Women's game the night before, I had to tape the US-China game. The 4-1 win by the US was greatly entertaining. Run DMB's speed was on display, Benny Feilhaber had a sweet touch on his goal, and Deuce and Gooch both had nice header goals late to ice the match for the home side. Now I can't wait for the Gold Cup opener late Thursday night. - I also watched my taped edition of the DC-LA Fox Soccer Channel MLS game of the week. But since the match was a scoreless draw, the less said about that two hours of my life that I'll never get back, the better. - Rhinos 1 Puerto Rico 1 - Hamed Diallo got his first game action since coming on at halftime in Seattle four games ago and he gets the late equalizer to salvage a point for the Rhinos. Diallo's goal was set up by fellow second half sub Rey Martinez. The win puts the Rhinos at second in the table. But, given that the Rhinos have the most games played in the USL 1st Division, they are actually only 5th in the standings if you look at points per game played. The Rhinos will get a big test this weekend as they travel down to Cary on Friday night and then host the Portland Timbers on Saturday. Portland is currently 3rd in the points per game standings and both of these matches this weekend will be a step up in competition in comparison to the teams that the Rhinos have played over the past two weekends. - Rhinos Women 0 Toronto 2 - The Rhinos didn't take their two starting forwards from the previous night's game across the border. Nicole Olszewski left Saturday's game with a knee injury, so her not being in Toronto wasn't much of a surprise. Gretchen Miller not making the trip was surprising to me. The Rhinos once again had trouble getting a ball past 2006 W-League goalkeeper of the year Justine Bernier. But, improving from a 4-0 loss in the home opener to a 2-0 loss on the road versus Toronto appears to be a sign that the team is improving game to game. - Any supporter looking for a cheap airhorn, needs to check this blog post by Jarrett Campbell out. - Tony Sanneh to the Red Bulls? You know the Red Bulls defensive depth issues are serious when they are taking a look at one guy who may consider Red Bulls captain Claudio Reyna an ironman. - Lee Nguyen got his first USMNT cap on Saturday night, but it doesn't appear that he'll be spending a bunch more time playing stateside this summer. Yanks Abroad is debunking rumors that the PSV Eindhoven midfielder was looking at an offseason loan to an MLS club. That's too bad because there are a lot of teams that could use a player like Nguyen.